Why is running water so important? Research shows that one of the best ways to improve your pet's health is to get them to drink more water, and the best way to do that is with a free flowing pet fountain. By using free-falling stream of water, the pet fountain continually aerates your pet's water with healthful oxygen. A charcoal filter removes bad tastes and odours, giving your pet the best possible, and most appealing, way to stay hydrated! Your pet’s health and vitality require adequate water consumption. Our carefully developedcat water fountains, unique design maximises the appeal of drinking with plenty of water movement to ensure naturally oxygenated, cool water throughout the day. Features Multi-height drinking levels .. Your dogs health and vitality require adequate water consumption. Our carefully developed dog water fountains, unique design maximises the appeal of drinking with plenty of water movement to ensure naturally oxygenated, cool water throughout the day. 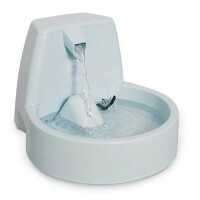 Features Multi-height drinking..
Compatable with: Replacement pump for Cat Mate Pet Fountain (Ref. 335). ..